As I was browsing my local high-end grocer's produce department, a bag caught my eye. A photo of pea pods, arranged like a haphazard fence, indicated its contents, so I tossed it into my shopping basket without any more thought. I felt very pleased with myself and I anticipated enjoying some fresh, crisp sugar snap peas. WRONG! I returned from the store and my post-shopping snack attack led me to open the aforementioned bag. As it turns out, I had just purchased Calbee Snack Salad Snapea Crisps. Delicate & tasty. Original flavor. Baked. Net wt. 3.3 oz. The detailed photo showing peas bulging in pods on the packaging wants us to believe that whole snap peas, in-pod, were baked. I have a different theory. My theory is that a cauldron of pea soup was left to boil until it was reduced to dried pea sludge. This product was then made into a fine powder and then reconstituted with water before being molded into fuzzy-looking (but not fuzzy) pod-like shapes. Why else would rice be in the list of ingredients? Taking a cross-section of said pods indicates no discernible individual peas, which just adds more clout to my argument. Despite the onset of snack confusion, I continued chomping away. I am not even sure if chomping is the right word. 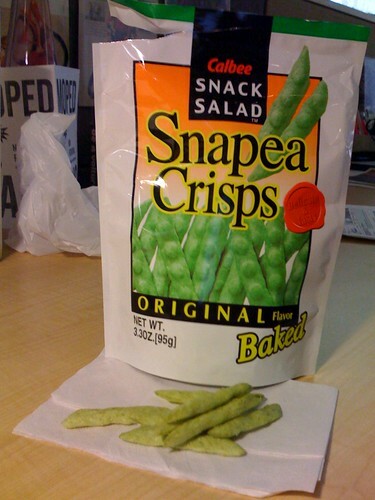 These Snapea Crisps aren't really they crisp. They don't snap or crunch. It would be more accurate to say that I was mashing them and dissipating the powder with my teeth as I chewed. The crisps are a light and airy snack, and I am confident that anyone could eat an entire bag in one sitting and still feel hungry. More importantly, they taste good. The familiar flavor of non-fresh peas is subtly present, and the flavor tricks your tongue into believing that the crisps are more heavily seasoned than they are. The list of ingredients is simple: Green peas, corn oil, rice, salt, calcium carbonate, ascorbic acid (vitamin c). Adding to this snack's intrigue is the supposed availability of a Caesar-flavored variety, which is sadly not sold at my local store. My snack confusion yielded a pleasant surprise and I'll conclude this review in agreement with the folks at Calbee America, Inc., quoting the conclusion of the Snapea Crisps product essay: "[I] propose this product as a new type of snack." By the way, I dare you to win the High School Lunch Memories Contest. Winners will be announced next week. "They don't snap or crunch. It would be more accurate to say that I was mashing them and dissipating the powder with my teeth as I chewed." Dude, I love these things. They are the Cat's Meow! I eat entire bags and I'm left wanting more, much like heroin--how brilliant! Kudos to those foodologists for bringing this concoction together for your everyday enjoyment. Yeah I love snap pea snacks. They make a great salad topper. so should I eat these? @most biggest: They're weird but you should definitely try them. You're in for a pleasant surprise. These things are like Lays potato chips, you can't stop eating them. It's sad when you're down to the last few.